Welcome to ACNM's online Membership & Practice Directories. ACNM iscommitted to improving services for our members, and hope you enjoy being able to search for your colleagues' latest contact information right from your computer.ACNM will update these listings on a daily basis, giving you the most accurate and current contact information possible. Plus, we are saving trees! Search for members by last name, city, state, or zip code. The more information you provide, the more concise the search results will be. Use the link on the results page to email ACNM with contact information updates or to inquire about missing listings. Search for midwifery practices where ACNM members see patients. From the practice result page link to the practice email and web site, as well as the membership directory listings of the members associated with the practice. Please read this agreement before entering the directories. 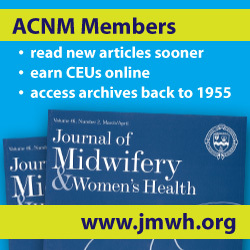 All contents 2013 by the American College of Nurse-Midwives (ACNM). ACNM will license to you the contents of this online directory only if you accept all of the terms and conditions contained in this non-exclusive, non-transferable, limited license agreement. Please read this license agreement carefully before viewing the Membership or Practice Directory. By viewing this Directory, you hereby accept and agree to be bound by the following terms and conditions: this Directory shall be used for individual, personal and confidential reference purposes only and may be used only pursuant to the terms of this license agreement. This Directory and its contents are proprietary products of ACNM. The contents of this Directory may not, in whole or in part, be reproduced, copied, disseminated, entered into a computer database, used as part of or in connection with a mailing list, or otherwise utilized in any form or manner or by any means, except for the user's individual, personal and confidential reference.